A tamagotchi is a "cyber creature who has traveled millions of miles from its home planet to learn what life is like on earth" (Bandai 1996). These creatures were found by a professor and his assistant, Mikachu. The two built these creatures "little egg-shaped protection cases so they could survive on earth" (www.mimitchi.com). If these lovely virtual creatures receive "proper care and feeding", they will grow into "different shapes and personalities" and may live on earth for as long as 31 years (www.mimitchi.com). (One earth day is equal to about one year for tamagotchi.) However, as soon as one "wakes up" his or her tamagotchi "from its million light-year sleep by removing the insulating sheet", constant attention has to be given to the tamagotchi (Bandai 1996). It does not matter if one is attending a meeting or if one is cooking, a tamagotchi will still beep at its owner for attention. And if it is ignored when it is in need, the tamagotchi will "grow into an unattractive alien" and eventually "return to its home planet", which is millions of miles away. But by pressing the reset switch on the back of the case, the leveling of timeline occurs - another tamagotchi wakes up from its million light-year sleep. A 31-year-old Japanese woman, Aki Maita, loved to keep pets, and would like to own pets that could be brought everywhere with her (www.mimitchi.com). She came up with a virtual pet idea and sold it to Bandai Corporation, one of the biggest toy manufacturer in Japan. Basing on her ideas, Bandai designed a handheld LCD video game that was attached to a key chain or bracelet. Bandai named their new product "tamagotchi" (In Japanese, "tamago" means "egg" and "tomodatchi" means "friend". So the word literally means "egg-friend") (www.mimitchi.com). The product was first released in Japan on November 23, 1996. In less than a year, the tamagotchi became available in 30 countries and there were nearly 400 licensed products associated with tamagotchi, including shirts, hats, underwear, stuffed animals, stationary, and even portable phones with an LCD display that doubles as a tamagotchi game interface (is.gseis.ucla.edu). Overall, the commodification of Aki Maita's idea was very successful. Bandai sold over 5 million units in Japan and 6 million unites in the United States, generating over $160 million in revenue from the Japanese release and over $80 million revenue from the American release (www.jitterbug.com). Witnessing such high demand for virtual pet commodities, Bandai's competitors, such as Tiger Electronics, Playmates, Nintendo, started to release their own versions of Giga Pets, Nano Pets, Nano Fighters and Dinky Dino. While Bandai marketed itself as the developer of "the original virtual reality pet", its competitors claimed to provide one with the original experiences of raising frogs, kitties, puppies, babies and even dinosaurs (Bandai 1996). It is an example of the Xerox-degree of culture where "the original" could no longer be located. Postmodern theorist Jean Baudrillard coined the term "hyperreality" to describe "the condition whereby imitations or reproductions of reality acquire more legitimacy, value, and power than the originals themselves" (Taylor 183). Ecologists and archaeologists uncovered long buried bones and stones to speculate how dinosaurs look like without ever seeing one. Dinky Dino developers combined some of the characteristics from the ecologists' and archaeologists' models to compile a dinosaur-keeping experience. Such simulated experiences "appear real and, in fact, acquire aspects of reality, they are never merely fictional" (Taylor 183). No history books tell us about the prehistorical dinosaur-keeping experiences, but nowadays, one could write about their dinosaur-keeping experiences; one could even be nostalgic for a dinosaur-keeping experience! Indeed, it is definitely a creative idea to be keeping dinosaurs as pets. However, some find it quite unacceptable to be imagining that a baby is a pet. With the release of the Nano baby, the boundaries between babies and pets, or even humans and animals, have become fuzzy. 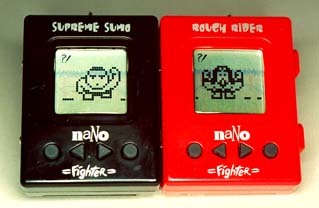 The release of Nano Fighters also made many educators to be concerned because keeping a pet to fight is not a desired amusement activity. Moreover, there is no doubt that these electronic games are not animals. They are empty signifiers because "a dog is a man's best friend", but a tamagotchi, or a Nano baby is not humans' best friend. See bibliography for photo credits. Click here to download a tamagotchi simulator (Japanese Version).